Pothos is arguably the easiest of all houseplants to grow, even if you are a person who forgets to water your plants. This trailing vine has pointed, heart-shaped green leaves, sometimes variegated with white, yellow, or pale green. While pothos likes bright, indirect light it can thrive in areas that don’t get a lot of sunlight or have only fluorescent lighting. It's an excellent plant for locations such as offices and dorm rooms. One advantage of growing pothos is that they are high on the list of plants that can help purify indoor air of chemicals such as formaldehyde, trichloroethene, toluene, xylene, and benzene. Pothos vines do not cling to trellises and supports on their own, but they can be trained onto supports to give the appearance of twining. As indoor plants, specimens 30 feet long are common, though most are kept much shorter. These plants can get leggy left unpruned. If allowed to dry out, the stems may become bare to the base, leaving leaves only on new growth. If you choose to let your pothos grow into a long vine, it can be secured on hooks along walls and over window frames. Vines left to grow on their own can get very tangled, so shake them loose every now and then to keep them from becoming a mess. While normally grown as a houseplant, pothos can serve as a perennial outdoor plant in USDA hardiness zones 10 and 11. In other zones, they can be used in containers and borders in the summer. They will die back with the first frost, but you can always bring them back indoors or simply take cuttings. Pothos are usually pest free, but they can get infested with mealy bugs. Insecticidal soap works against them, but the easiest method is to simply dab the insects with an alcohol-soaked cotton swab. Outdoors, pothos can be grown in shade to partial shade. Indoors, pothos prefers bright but indirect light. Variegated plants sometimes lose their leaf pattern and revert to all-green plants if they don't get enough light; moving them to brighter conditions usually restores the variegation. Suddenly paler-looking leaves mean the plant is getting too much sun. Pothos plants thrive in ordinary, well-draining potting soil, preferably with a slightly acidic pH. Pothos like to have their soil dry out completely between waterings. If left continually in damp soil, the roots will rot. Black spots on the leaves and the sudden collapse of the plant indicate the soil has been kept too wet. Let the plant tell you when to water—when it starts to droop, it needs a good drink. However, don’t wait until the leaves start to shrivel or you will lose some leaves. Dry, brown edges mean the plant was kept dry too long. Pothos should be kept above 50 F, and these plants like the common room temperature of 65 to 75 F. This plant likes high humidity but it is very tolerant and can thrive even where there is low humidity. Pothos aren’t heavy feeders, but since there are no nutrients in most potting soils, feed monthly to bi-monthly with any balanced houseplant fertilizer. Eventually, your pothos will become pot bound. When the leaves droop, no matter how much or often you water them, the roots have probably filled the pot. Carefully lift the plant and check to see if this is the problem. When the plant has reached this stage, you can re-pot in a container one or two sizes larger, filled with fresh potting soil. Keep the stems trimmed relatively short to keep foliage full along the full stems. If stems grow bare, they can be cut back to the soil level, and new stems will sprout. This plant is easily propagated simply by taking stem cuttings and rooting them in water or in potting soil. Move cuttings rooted in water into the soil as soon as possible so they can begin getting nutrients. Many varieties of pothos have been developed with different types of leaf variegation featuring white, yellow, or light green patches interrupting the predominant deep green. There are also cultivars with leaves that are a solid light green. 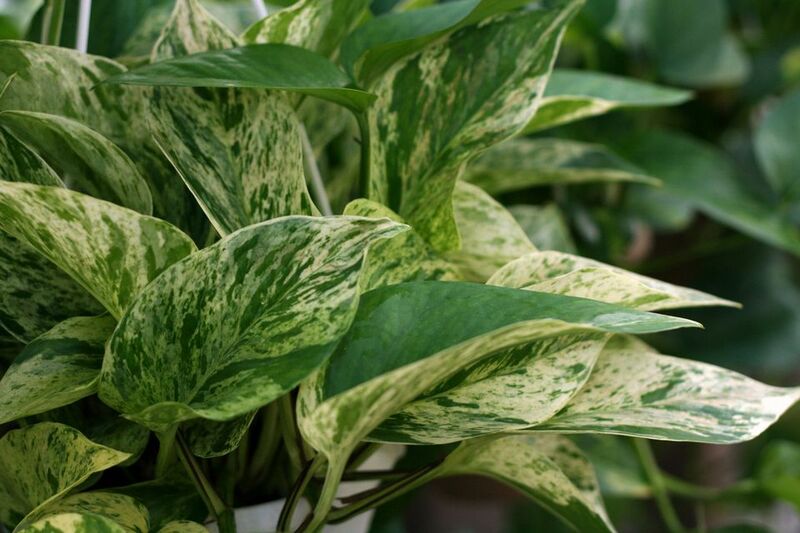 "Marble Queen" has exceptionally attractive white-and-green variegated leaves. It needs more light than most pothos. "Pearls and Jade" is a white-and-green variegated form with small dots of green. "Neon" is a bright chartreuse variety, great for darker spaces. "Silver Satin" has thick gray-green leaves with silver splotches. It is very tolerant of drought and low-light conditions. All parts of the pothos plant are poisonous if ingested. Be on alert if you have dogs or cats. The toxicity is due to calcium oxalate crystals, which can irritate the lips, mouth, and tongue. Contact your veterinarian if your pet has chewed on this plant and your doctor or poison control center if eaten by a child or adult. Pothos is sometimes mislabeled as Philodendron in plant stores. The varieties of philodendron that are vining and have heart-shaped leaves look similar to pothos. The difference would be mostly in appearance, with pothos having larger, waxy leaves. The general growing conditions and care are similar for both plants, so misidentification should not be a problem for most uses.